We were having a beautiful experience traveling through Spain; getting a sense of its history, enjoying exquisite scenery, and living the lives of jet-setters. Everyone we met was friendly, welcoming and pleasant. 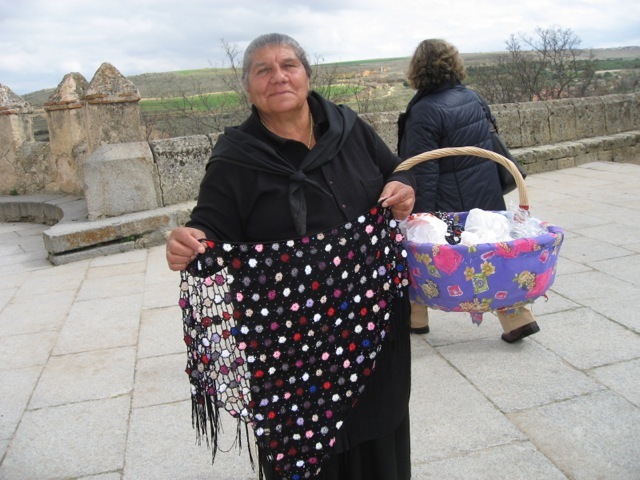 Until we came upon her: an elderly local woman with a basket full of crocheted shawls. All I had to do was make initial eye contact and “my goose was cooked.” She earmarked me as a prospective customer, and nothing I could do could save me from those persistent eyes. She started to follow me across the church patio, holding up a shawl with a pleading expression on her face. “Twenty five dollars,” she begged. No, I said, walking away. But she persisted, following me across the plaza. Bargain with her, my inner voice coaxed. Don’t agree to the first price she offers. Is it hand made? I asked. She held up her hands and pointed to her arthritic old fingers, signaling that she crocheted every stitch by hand. Along with the hand-showing she put on a pathetically sad, overworked, exhausted expression. Poor old thing, I commiserated. She looks at my life, a traveling tourist able to afford the luxury of leaving my country to explore hers, while she labors away stitching these shawls. She probably sews in a room with poor light and uncomfortable back-breaking chairs. I’ll bet she lives with her family, including a bunch of small children whom she helps support. How can I haggle with her for a miserable few dollars? I could always use a hand crocheted black shawl, I reasoned convincingly. So I gave in and paid her the full price she asked. I tucked my new purchase into my traveling bag and joined my husband and friends for a tour of the church. On the way back to the hotel, we passed a shop in town filled with local souvenirs. They were selling for $15.00 apiece. As Princess assigns a dressing room to me she scavenges the back room for some dresses for my to approval. I notice her style of addressing customers. She uses “sweet names” like “darlin”, “sweetie” and “honeybunch.” She sprinkles her comments to me with those endearments as we work together. Princess considers herself a “fashionista”. “I love to keep up with the latest trends in fashion.” She puts together colors and accessories that make an outfit stunning, interesting and individual. This experience is becoming fun. Her little pointers are welcomely surprising. “Hold on a minute,” she says again, and runs out of the dressing room: this time to bring shoes to make the outfit sensational. “Nobody looks good with bare feet,” she admonishes, as I stand in the dressing room in my bare feet. “Let me get you something cold to drink”, she says and rushes out to bring me an icy bottle of Perrier. She rattles off stories about customers, as I’m changing from one outfit to another. “I have a customer who insists on squeezing into a size 8 dress when she clearly is a size 12. And one who came into the store in such an agitated state that I steered her straight into a lounge, brought her a drink and calmed her before allowing her to see any clothes. I am enjoying the attention and advice about my quest for the perfect fall outfit, and Princess’ expert advice about adding the right shoes and jewelry. All she cares about is making me look my best. Suddenly that mood changes. She pulls a chair into the dressing room and sits down. Gone is her aura of professionalism. Gone is the fashionista with all her tricks and advice. I am suddenly in the presence of a woman with a man problem. And she seems determined to reveal her situation rather than revealing a new, stylish me. “What are your ideas about marriage?” I ask, begrudgingly being drawn into her dilemma. Hearing the Princess version of judging a lifetime commitment by way of magazine articles, quizzes and Hollywood depictions of marriage make me realize that I cannot give advice to this fairy tale believing saleswoman. She is either terribly naive, or there is a lot more to this story than I know. And I don’t want to know: I just want a new fall outfit. So I thank her for her help, pay for the outfit and assure her that everything will work out fine. I leave the store, vowing to enjoy my new cocktail suit at the fall party.